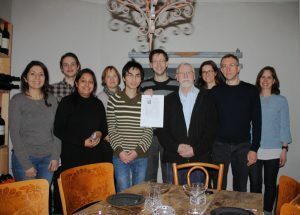 Just before Christmas we went out for lunch together with the group of Andrei Chabes. The occasion was Vladimir’s retirement. In this case “retirement” must actually be put in quotes since Vladimir is still affiliated with the department and continues to come here and share his knowledge with us. As the true scientist that he is, Vladimir had prepared a data slide to share with us during lunch: his publication count as a function of calendar year -for the last 50 years! Some data points were discussed a bit more, such as the publication of his Master’s thesis in BBA in 1964, the year that Andrei Chabes (our current head of department) became Vladimir’s Master’s student, and the year Vladimir moved to Sweden. Vladimir, your contributions to setting up our lab here have been invaluable and we are really happy to still have you around. Thanks!